Mark Hughes has sounded out the physical threat of Glenn Murray ahead of Southampton's match against Brighton on Monday Night Football. Southampton and Brighton played out two 1-1 draws in the Premier League last season, with Murray on target on both occasions. Hughes spoke of his overall admiration for Brighton ahead of Monday's clash at St Mary's - live on Sky Sports Premier League - but reserved special praise for 34-year-old striker Murray. "They've got a lot of guys that have grasped the opportunity to play in the Premier League and are now enjoying the day-in, day-out challenge that playing in the league brings," said Hughes. "Along with that they've still got a guy up top who's a little bit older than some of them and still has an impact for them. You have to be respectful of the talent they have." Hughes was known for having a physical presence up front during his playing days, and was also famed for his longevity - playing in the Premier League until retiring aged 38. The former Manchester United, Chelsea and Southampton striker admitted to getting wiser as his fitness waned, and said the same appears to be the case for Murray, whom he likened to forwards of eras gone by. Hughes added: "The older you get, you get a better understanding of the game. The only thing that diminishes is your physical capability. I'm a lot better player now than I ever was, I just can't run. "You get a little bit wiser in terms of understanding your physical capabilities. 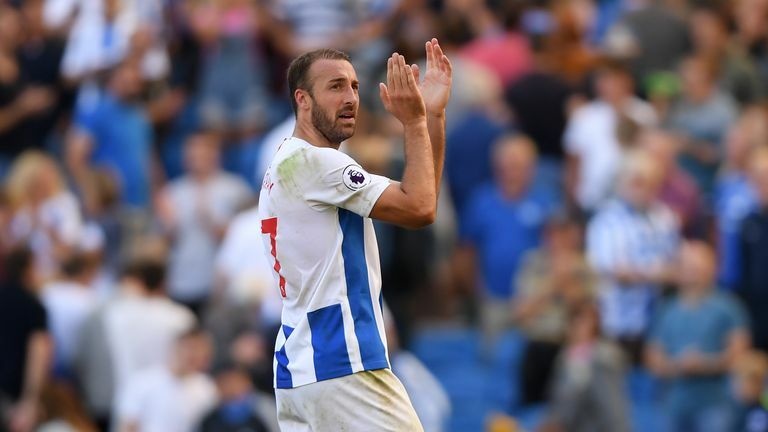 It certainly looks like Glenn Murray is one of those players that understands the game better now, and how he can use his remaining physical attributes to the best of his ability. "He's very clever in what he does. He's actually one of the few types of his ilk, when I was playing there were a lot of strikers that were using their body and physical strength with their back to goal. "He's one of very few, there used to be ten a penny but they don't seem as prevalent as they used to be." Regarding his own strikers, Hughes conceded there are slight doubts surrounding the fitness of Charlie Austin (hamstring) and Shane Long (toe) going into Monday's tie, but remains confident they will be fit in time to challenge Danny Ings for a starting role. "What we've got is good variation. I'm happy with the different qualities each of them brings to the party," Hughes added. "I won't sit here and tell you, 'Well that's my number one pairing', or that we'll go with just one, I've got variation in terms of what I can do, given the opposition we're facing. "We've got a little concern with Shane and Charlie actually, because they haven't trained this week, but we're hoping to get them back for Saturday or Sunday. Hopefully that will give us the options we want."